Scabies not treated early then develops secondary bacterial infection with streptococci or staphylococi. Untreated lesions of scabis convert into pustules and bullae filled with pus. These lesions burst, get converted with purulent, yellowish crusts it is due to scrating erosion forms. This condition is usually develops in infants and children. 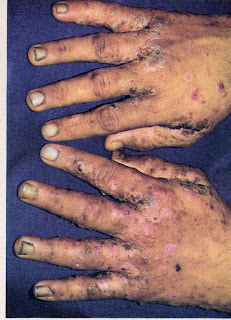 Diseased areas display erythema, edema, vasiculation, oozing and serosanguinous crusting. Face is usually involved in infants. Paraphimosis is develops due to retracted edematous preputial skin which is unable to take forward. Condition is commonly seen in children.